Don’t look now, but the compliance Internet is all a-Twitter today because Deputy Attorney General Rod Rosenstein said in a public forum that maybe, sometime soon, the Justice Department might change its views of corporate cooperation under the Yates Memo— or then again, maybe not. Who knows, really. To remind everyone, the Yates Memo is the department’s policy document from 2015 that broke practically zero fresh ground on corporate misconduct prosecutions, and was political theater to mask the Obama Administration’s tendency to prosecute practically zero Wall Street executives for the financial crisis. But, hey, it was an Obama Administration policy, so as a member of the Trump Administration, Rosenstein was pretty much duty bound to say he wants to revisit it. Whether that revisitation would make any actual sense or difference is beside the point. Rosenstein’s comments might get picked up by Fox & Friends, so President Trump might see them and be nice to Rosenstein on Twitter for, like, a week or something. That qualifies as career advancement Washington these days. Seriously: read the media reports of Rosenstein’s comments yesterday. He was speaking at the Heritage Foundation, a once respectable conservative think tank, that has since devolved into a fanboy organization for all things Trump. Rosenstein first gave a prepared speech about the rule of law. That alone is rich, given that the man he works for couldn’t care one whit about the rule of law, except for the part where the rule of law might yet oust Trump from the presidency. Or, if we want to keep the calendar, Rosenstein stressed the importance of rule of law 20 days after Trump pardoned Joe Arpaio for criminal contempt of a court of law. He also made his remarks on the same day the New York Times wrote a damning story about his boss, attorney general Jeff Sessions, and how Trump humiliated Sessions because he recused himself from the Russia probe rather than shut it down to protect Trump. But we digress. We’re here to talk about Rosenstein’s non-comment comments on the Yates Memo. During a Q&A after Rosenstein’s speech, someone asked a question about the Yates Memo and corporate prosecutions. First, we should note that all questions had to be submitted in writing and were screened by the Heritage Foundation. In other words, the Heritage Foundation geared this whole affair to flatter conservative talking points. No surprise, then, that Rosenstein made vague promises of reviewing the Yates Memo, because that’s what Trump people want to hear, without saying anything specific or substantive. Diehards can also watch Rosenstein’s entire talk on C-SPAN. His remarks about corporate prosecutions and the Yates Memo happen around the 39-minute mark. They are just as vague as the media reports above. Let’s get down to brass tacks. Of course Rosenstein was going to promise some possible change, sometime soon— because that’s what all deputy attorney generals do, especially when talking to core political constituencies, which the Heritage Foundation certainly is. But on a practical level, what’s really going to change, and to what extent? Rosenstein isn’t going to say corporations need to be held more accountable; that’s heresy to the current ruling political class in Washington. And if he says the department is going to pursue individuals more vigorously— well, lack of individual accountability is precisely the complaint raised in The Chickenshit Club. Rosenstein would also suddenly find himself in step with folks on the left like Sen. Elizabeth Warren, who would just as soon have all the bankers at Wells Fargo excommunicated as much as she wants Wells to pay yet another fine for yet more misconduct. Rosenstein could expand and formalize what we’ve already seen happen with the FCPA Pilot Program. Under the Trump Administration, the program has moved from fewer monetary penalties to no monetary penalties at all; FCPA offenders only hand over ill-gotten profits and bear the costs of internal investigations. Those costs aren’t necessarily small, but they’re smaller than what we’ve seen before. And let’s remember, when people say that monetary penalties only hurt shareholders, they have a point. 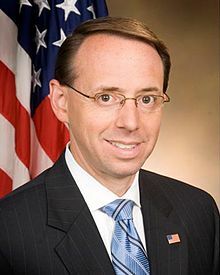 If Rosenstein is serious about holding individuals accountable, in a scary way that really would make senior executives take good conduct seriously, he could enact a policy where the Justice Department pushes for permanent loss of professional licenses (CPA or law licenses, mostly); or permanent disbarment of executives from working in public companies. That would scare people. I don’t believe the Trump Administration would ever propose it, but that’s one alternative way of thinking. The only way Rosenstein might jolt compliance officers is to announce a lessening of attention to corporate compliance programs. That is, the department would still hand out non-prosecution agreements and no penalties per the FCPA Pilot Program, but companies wouldn’t need to self-disclose misconduct, or cooperate with pursuing individual wrongdoers, or remediate their issues. That would be a big step backward that undermines the importance of ethics and compliance programs. I don’t see Rosenstein endorsing that, either. Most likely: sometime in the future, Rosenstein take the current practice of the FCPA Pilot Program department-wide, and call it a policy. Then Sessions and Trump Administration people in the West Wing will rebudget the department to divert Fraud Section dollars to their other priorities, like deporting DACA immigrants, arresting gang-bangers, and dropping defenses for litigation over Obama-era policies. That’s another way to do something without saying anything.